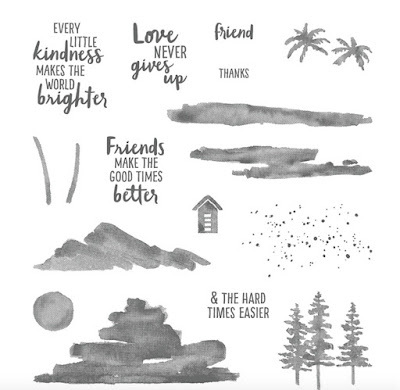 Yesterday I shared a card I made using the Waterfront Stamp Set. I have more to share today! My son is stationed on Oahu, Hawaii while in the Coast Guard, and 2 1/2 years ago I had the pleasure of visiting him with my youngest son. It was a great experience and we had a lot of fun the time I was there. 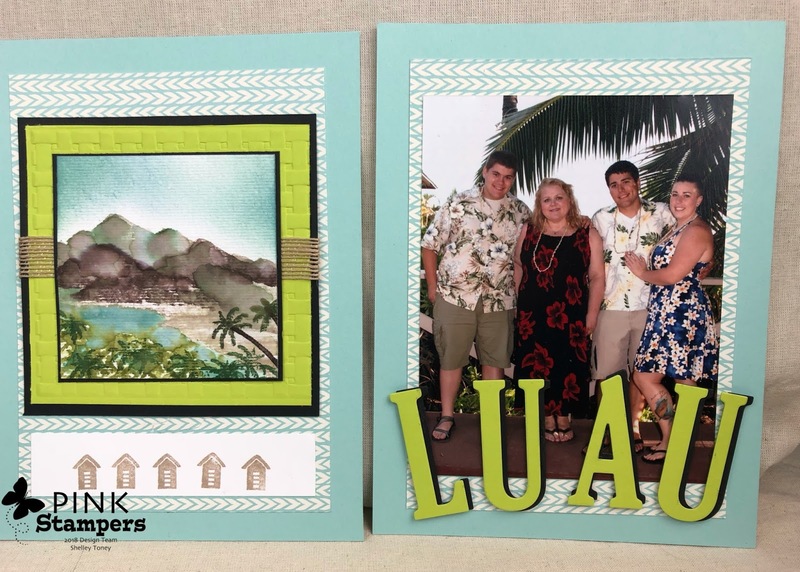 I have scrapbooked most of the photos I took already, but there was one professional photo we purchased at the Luau we attended that never made its way into my scrapbook. When I saw the palm trees and beach huts, I tried my hand at creating a little tropical island take on things with the stamps. I still used watercolor paper because I wanted to try and blend out the colors a little bit along with some sponging across the sky. I almost tossed this example, until I saw the way the water looked coming up on the sandy beach and thought to myself, “that’s not half bad!” A little bit of trivia about me, is since that photo was taken, I have lost about 70 lbs! I think I need to go back to Hawaii! IMy next card was all about technique and can be used with just about any stamp applied to metallic paper. A couple things that you need to know are, Archival Black ink is important to use and a bit of patience when stamping onto metallic paper because it can smear if you aren’t careful. I started my smearing my stamp pad straight down from the top to give the streaky smeared effect. Then I turned it around and did the same from the bottom up. After this was created, I stamped my images directly on, being careful not to let the stamp slide to avoid a smeared image. At this point I heat set the images with my heat tool on the low setting before I added the sentiment to the card. This was just to avoid any accidental smearing. AND YES, fingers will get messy! After the sentiment was added I also dried it with my heat tool. The next step is to take the Versa Mark ink pad and complete cover the surface of the card. Watch out for finger prints, or you will leave those on your card. Then I dipped the entire face of the card into clear embossing powder, set it with heat and it makes a very cool crackly ice look. Just for fun, I did a second coat of the versa mark and embossing powder, but I think it looked good with only the 1 coat too. This really reminds me the gold leafing on acetate that was popular in the 80’s. But, this was really much simpler! 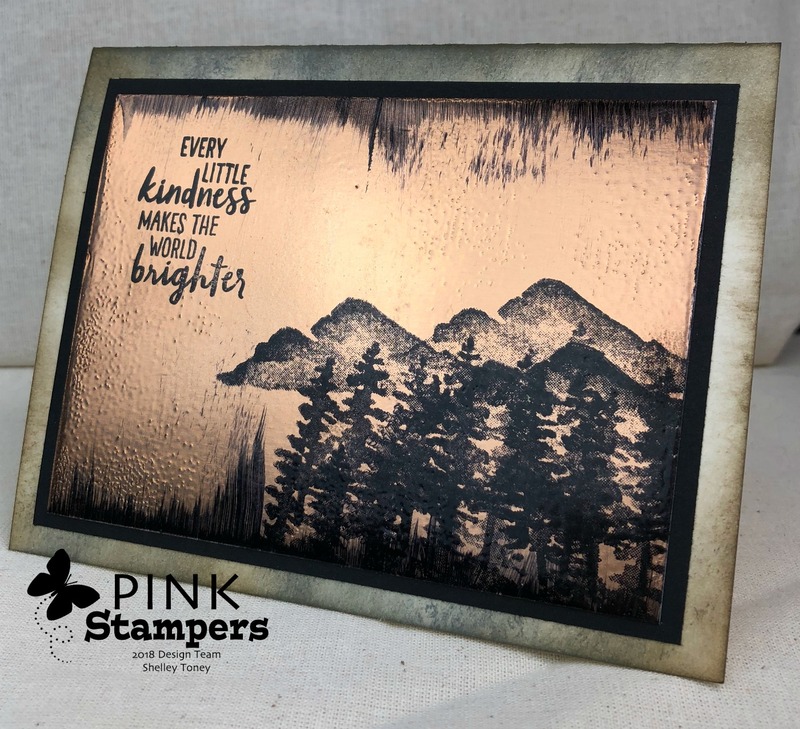 This would work with any of our metallic papers, but I used Copper for this example.